Dark Skies returns “the grays” to our alien consciousness, but as it turns out, these aliens are 2013 horror aliens. The Paranormal Activity reach into almost every horror movie of the past 5 years (and this one comes from PA producers) has led to ghosts and goblins who would much rather mess with you than actually achieve any goals. They certainly have the power to do whatever they want, but for some reason, they just want to frighten you a whole bunch first. It’s like a thief coming into your home and actually wanting to be detected. Instead of just stealing your stuff and getting away without a peep, he comes in and starts throwing dishware around, waits until you wake up, and then points a gun in your face and steals your TV. I know, I know, that seems pointless. But I think about all the horror movies that have come out recently, and most of them have that characteristic. But you say, “Isn’t being scary what matters?” Well, yes and no. The whole point of a good ghost story is that the ghost wants something but can’t get it because they are ghosts. In the horrendous Mama, which actually got a pass from audiences for the most part, the “Mama” antagonist could easily accomplish her goals any time she wants, but chooses not to. All in the name of being freaky and scary…but unfortunately my mind is such that I just keep wondering why the monster doesn’t just go ahead and win already. 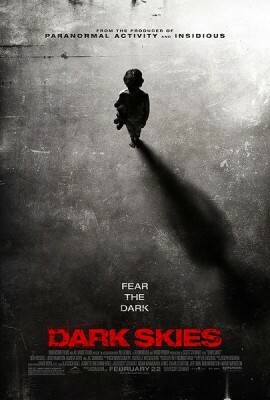 In Dark Skies, a family starts going through some crazy stuff they can’t explain. Lacy Barrett (Keri Russell) wakes up to a kitchen that looks ransacked by animals, then the next it looks like an Andy Warhol party broke out (or are those the same thing–hey-oh!). The alarms go off for no reason, Lacy’s husband Daniel (Josh Hamilton) can’t get through to the local police that something strange is going on. The younger son, Sam (Kadan Rockett), is sleepwalking and getting out of the house without the alarms going off. And the older son Jesse (Dakota Goyo) seems to be more affected by his outside surroundings than the ones going on around the house: all the wonders of adolescence. But, everyone in the family is going to have some issue with what goes on with the alien invaders. Of course, Sam, being a young child, will draw things that will be disturbing, because that’s what horror movie children do. And because we’re in 2013 and cameras are everywhere, Daniel sets up a horde of security cameras to hopefully capture something a la Paranormal Activity, even though the “found footage” of the movie is not the movie’s format. And research will need to take place. That will lead to a small role from JK Simmons, playing an alien “crackpot” who is actually the sane one. There are a couple of freaky moments in the movie that will definitely jar some people, but in the end, this is another mediocre attempt at horror. I understand the methodology here, and maybe it’s just a by-product, but while horror movie monsters are best when they have no motive, they are stupider when they have the power to do more but don’t for some reason.